New York just added an amendment to their constitution which allows non-doctors to perform abortions up to the date of birth. The Governor, Cuomo, lit up the Empire State building in PINK to celebrate. It will definitely be abused but this was for if the mother's health was in danger or other health risks to mother and baby, correct? Or was it just legal altogether? This isn't as black-and-white as people are making it seem, but the language is still likely vague enough to lead to abuse. Seems pretty black and red to me. There’s no way to make something this ugly seem not ugly. Late term abortions are terrible things. And in most circumstances they aren’t being done because Mom doesn’t feel like having a baby. It’s a brutal thing to try and politicize. But hey, YV tries to score points on the AW politics board when teenage girls are murdered so, par for the course I guess. Why are you bringing up DC protesters again? There’s no way to make something ugly seem not ugly. Late term abortions are terrible things. And in most circumstances they aren’t being done because Mom doesn’t feel like having a baby. It’s a brutal thing to try and politicize. But hey, YV tries to score points on the AW politics board when teenage girls are murdered so, par for the course I guess. What reasons do you believe are being given? As yk would say, this is your party. Yep, this is disgusting indeed. Even as I've become more "progressive," I am still pro-life. Maybe I’ve missed something, but there are people celebrating it ? Sorry if im misunderstanding, but what do you mean when you say what reasons are being given ? 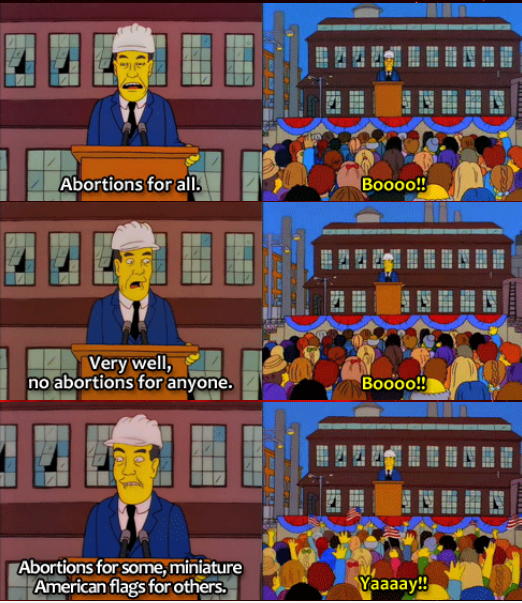 For the abortions ? My understanding is that late term abortions generally occur due to some severe developmental issue that often results in a very poor survivability outlook for the child or some other reason for the fetus to not be viable. Another obvious one is high risk to the mother. My personal opinion is that late stage abortions should be banned unless very specific viability criteria exists or if the mothers life is at risk. Whatever the case, this is a heartbreaking and extremely painful thing in most cases for the parents that have to make the decision. I think it’s wrong for people to try moralize and judge them for whatever they decide to do. My understanding is that late term abortions generally occur due to some severe developmental issue that often results very poor survivability outlook for the child or some other reason for the fetus to not be viable. Another obvious one is high risk to the mother. I don't know about you, but I want old men like the guys on this board deciding what's right for my daughter or wife's health. They seem to be super knowledgeable on the subject. I understand that they view this as the “right” thing to do. But I definitley agree with you that it’s gross. Extremely unnecessary. Pretty soon we'll be able to abort 4th Trimester fetuses!